The holidays can derail the diets of even the most determined individuals. Having an arsenal of healthy eating tips will encourage progress throughout the holidays and the new year! In part 1 of our healthy holidays series, we covered several ways to continue our fitness and health goals during the busy and stressful holiday season. In part 2 we’re going to build on those strategies by providing many eating tips. Imagine a battle scene from a Hollywood movie. A massive army standing on one side of a deep valley – but on the other side there’s only you. Now picture the army as a huge buffet packed with all of your favorites! Bah Humbug. Ok, so the ‘battle scene’ is a bit of a stretch, but when you’re trying to live a healthy lifestyle or even lose weight, the holiday season really can feel like you’re fighting against a never-ending army of temptations! More than just about anything else, do not show up to the party hungry. Many top dietitians and nutrition experts express that if you show up starving, you’re almost certainly going to overeat. Being prepared to enjoy some treats or a meal is fine, but if you arrive famished, you’ll have almost no self control available. Eating a small, healthy snack ahead of time will curb your appetite and allow you to savor the selections that you really want to eat. Next, don’t cut way back on your daily intake just so that you can binge at the party. A little bit of calorie saving is fine, but if you’ve banked all of your calories for the buffet line, prepare to eat way more than you probably should. On the day of a big party, plan your meals out so that you know you’ve gotten the nutrition your body needs. Lots of vegetables, fruit, lean protein and whole grains are not just for January to October! Want a sure-fire way to enjoy your food and decrease the likelihood of overindulging? Slow down. Another great way to increase satiety and get a healthy boost is to drink plenty of water. Recent studies found that people eat fewer total calories when they drink more water throughout the day. Instead of a martini or soda, grab a cup of water during the party. Drink a glass before you start eating and continue to take drinks between bites. While we’re on the subject of liquids, be sure to limit alcohol consumption. It’s common knowledge that alcohol lowers inhibitions. Even a small amount can increase the likelihood that you’ll forget about your health goals. Also, alcohol itself can be very high in calories. You’re much better off skipping a holiday cocktail or eggnog altogether, but if you are going to drink, drink it slowly. Opt for lower calorie drinks and limit the number of servings. Often people will forget that drinks have calories so keep in mind how much you imbibe! Be ready for the holiday buffet! Use a small plate. Lots of times you’ll be at an event with a wide variety of holiday fare served across an entire room (or several rooms!). Don’t pick up a plate right away. First, take a walk around the tables and survey your options. This way you can avoid loading up on foods that you’re only lukewarm about. After you know what to expect, select the smallest plate available. Start with healthy choices like salad, veggie sticks or the fruit plate. 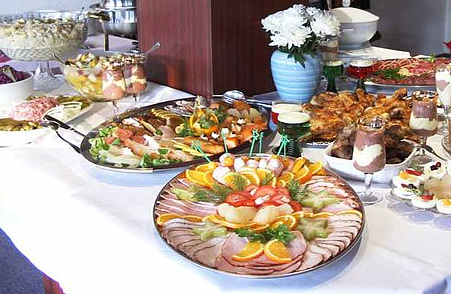 On your second trip go for the dishes that caught your attention or that other party-goers are raving about. By following these simple healthy eating tips for the holidays, you can keep your fitness and nutritional goals intact and still be able to enjoy your favorites!